Boys' cross country • After seeing six-year run of titles end in 2015, Cavemen get back on top. 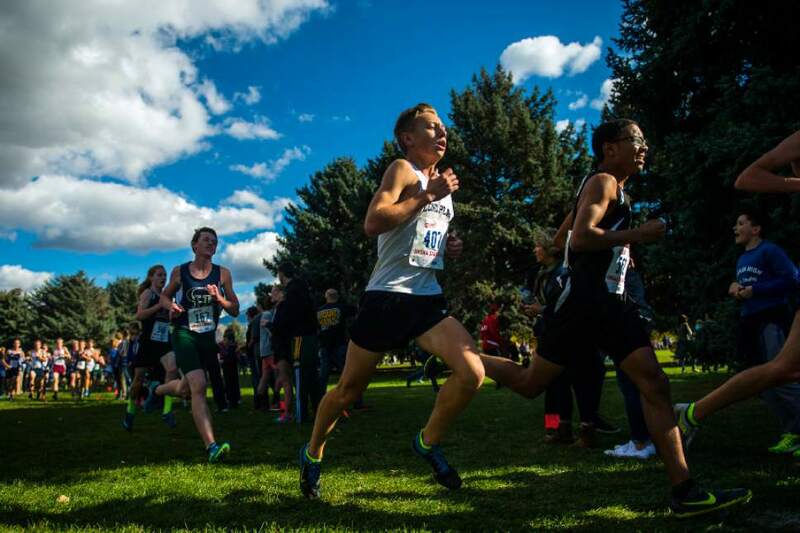 Chris Detrick | The Salt Lake Tribune Runners in the 3A division compete during the UHSAA State Cross Country Championships at Sugar House Park Wednesday October 19, 2016. Chris Detrick | The Salt Lake Tribune Runners in the 3A division compete during the UHSAA State Cross Country Championships at Sugar House Park Wednesday October 19, 2016. 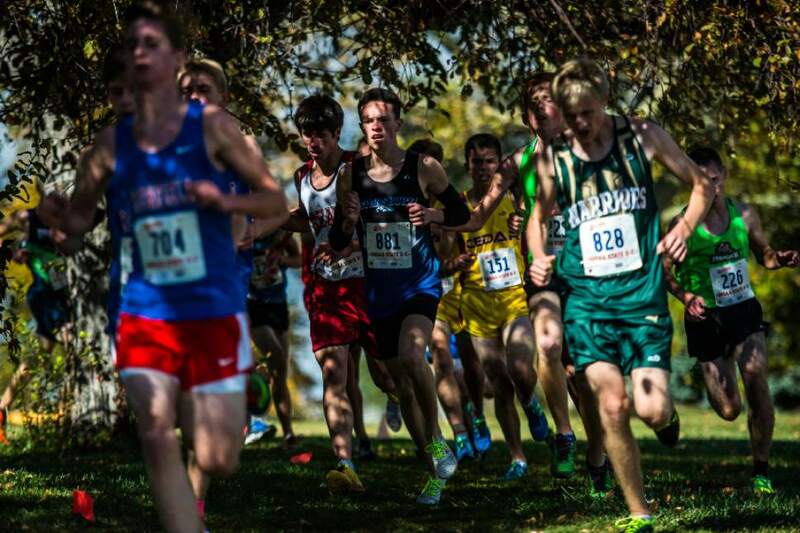 Chris Detrick | The Salt Lake Tribune Runners in the 4A division compete during the UHSAA State Cross Country Championships at Sugar House Park Wednesday October 19, 2016. 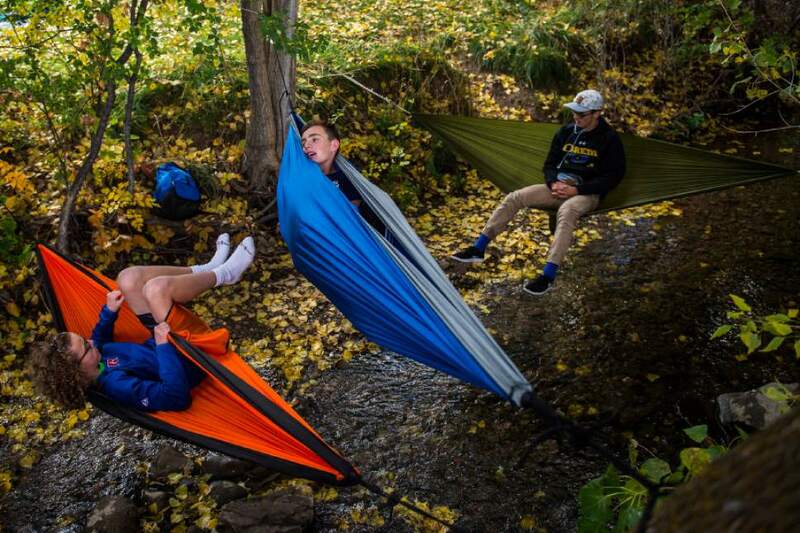 Chris Detrick | The Salt Lake Tribune (L-R) Richfield's Ethan Murray, Max Kemp and Orem's Junior Hallam relax in hammock during the UHSAA State Cross Country Championships at Sugar House Park Wednesday October 19, 2016. 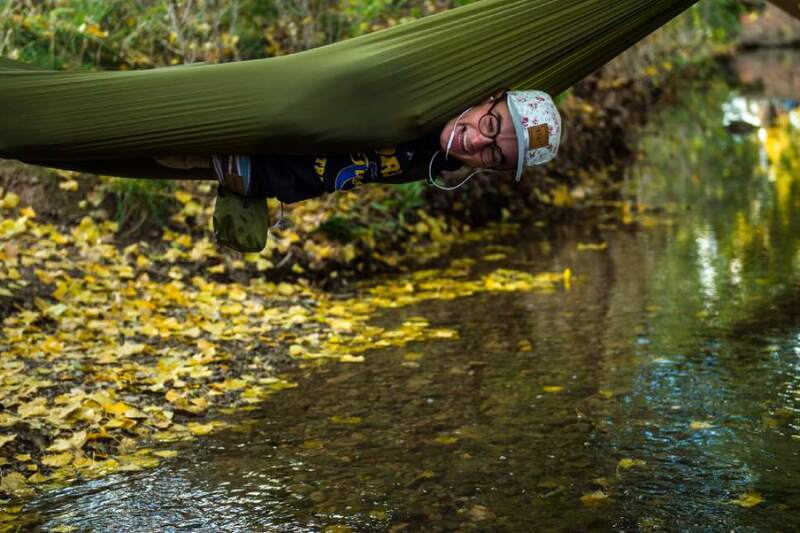 Chris Detrick | The Salt Lake Tribune Orem senior Junior Hallam hangs upside down in a hammock during the UHSAA State Cross Country Championships at Sugar House Park Wednesday October 19, 2016. 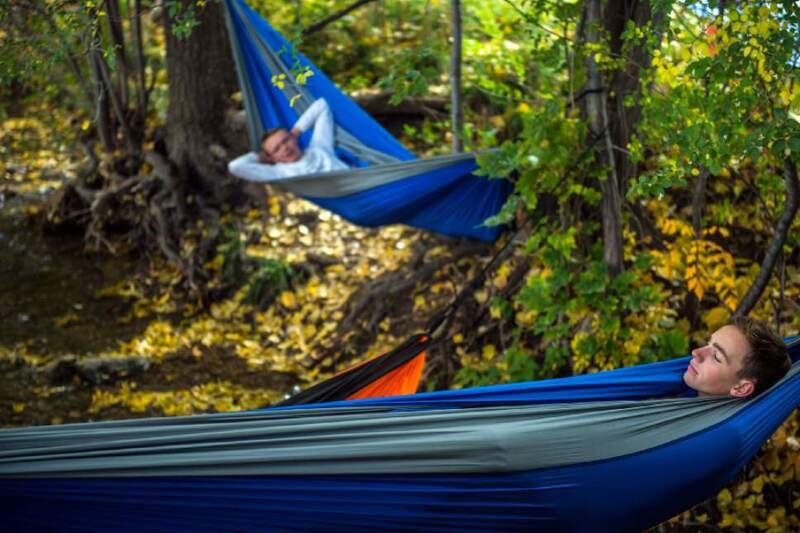 Chris Detrick | The Salt Lake Tribune Richfield freshman Max Kemp, front, and junior Jaden Kitchen relax in hammocks during the UHSAA State Cross Country Championships at Sugar House Park Wednesday October 19, 2016. Chris Detrick | The Salt Lake Tribune Lone Peak junior Josh Erickson (407) competes during the UHSAA State Cross Country Championships at Sugar House Park Wednesday October 19, 2016. 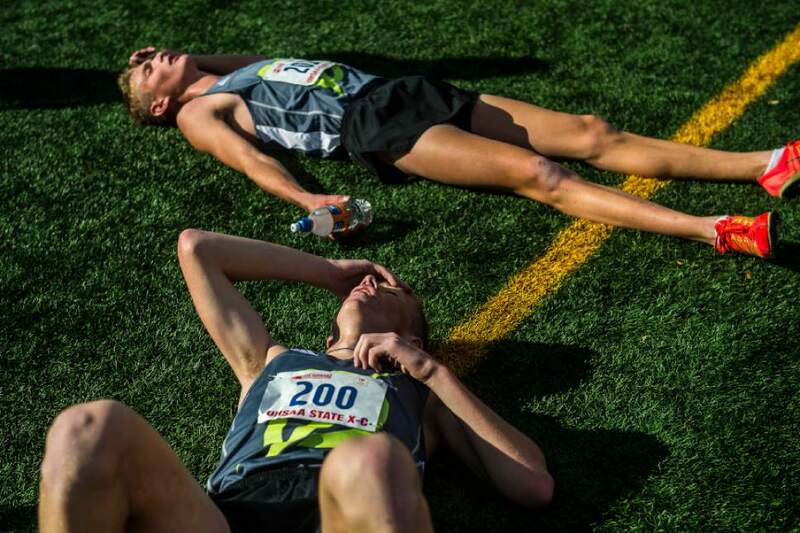 Chris Detrick | The Salt Lake Tribune Davis High School's Devin Jaster (200) and Josh Peters (201) rest on the ground after finishing the UHSAA State Cross Country Championships at Highland High School Wednesday October 19, 2016. Chris Detrick | The Salt Lake Tribune Canyon View senior Justin Huntd (126) competes during the UHSAA State Cross Country Championships at Sugar House Park Wednesday October 19, 2016. 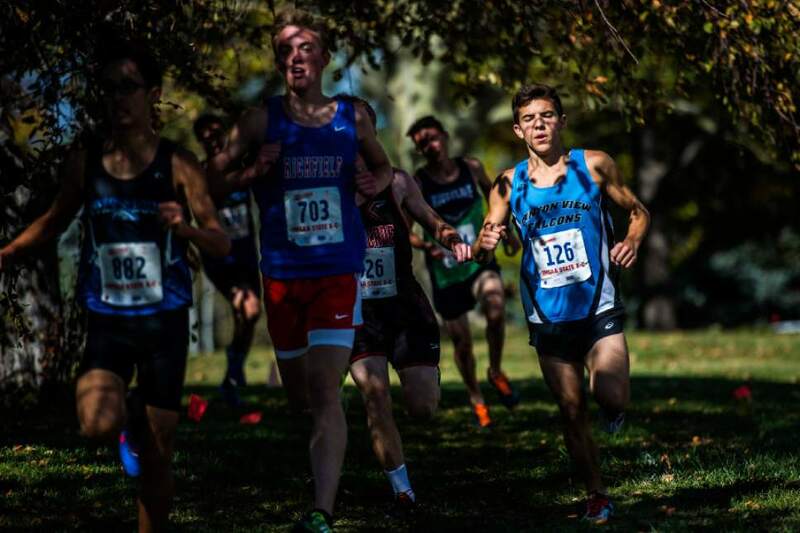 Chris Detrick | The Salt Lake Tribune Runners in the 4A division compete during the UHSAA State Cross Country Championships at Sugar House Park Wednesday October 19, 2016. 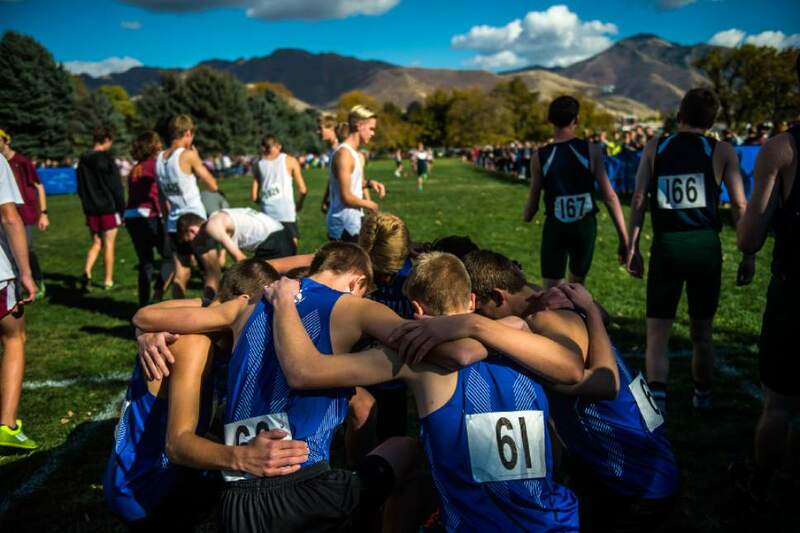 Chris Detrick | The Salt Lake Tribune Members of the Bingham High School team pray during the UHSAA State Cross Country Championships at Sugar House Park Wednesday October 19, 2016. 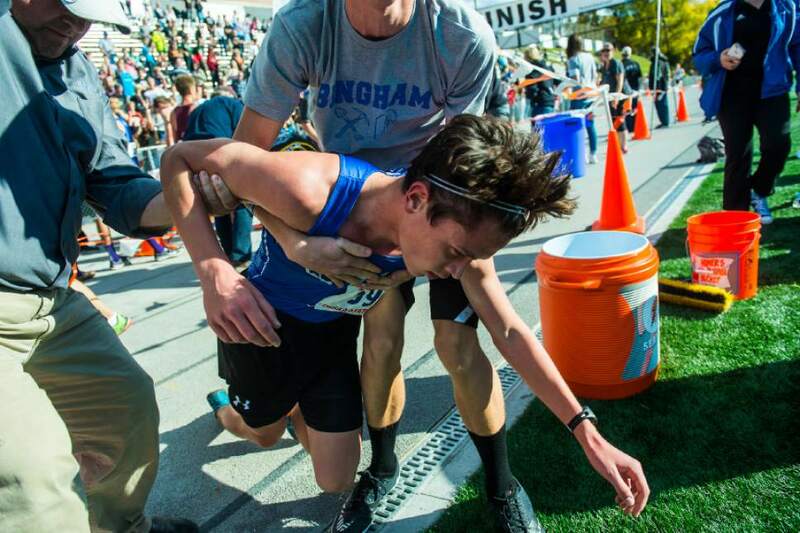 Chris Detrick | The Salt Lake Tribune Bingham senior Tyler LeBaron is helped after crossing the finish line during the UHSAA State Cross Country Championships at Highland High School Wednesday October 19, 2016. 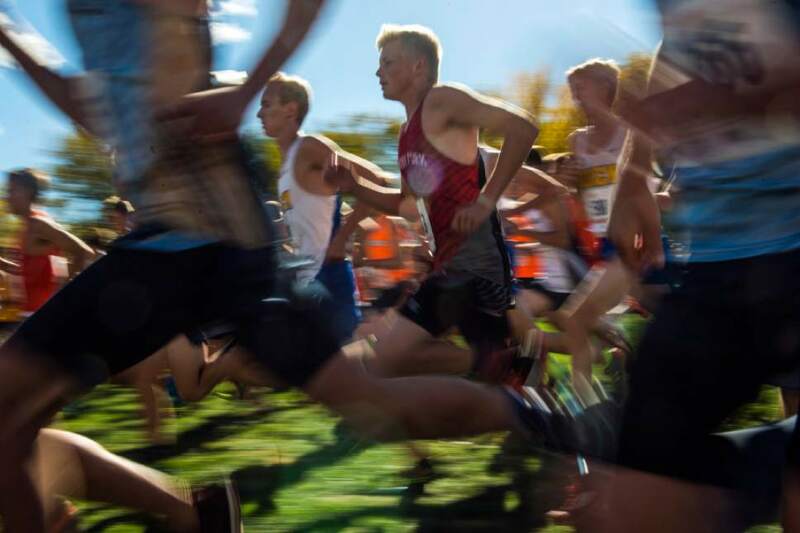 Chris Detrick | The Salt Lake Tribune Runners in the 4A division compete during the UHSAA State Cross Country Championships at Sugar House Park Wednesday October 19, 2016. Chris Detrick | The Salt Lake Tribune Spanish Fork senior Heston Andersen competes during the UHSAA State Cross Country Championships at Sugar House Park Wednesday October 19, 2016. Chris Detrick | The Salt Lake Tribune Runners in the 3A division compete during the UHSAA State Cross Country Championships at Sugar House Park Wednesday October 19, 2016. 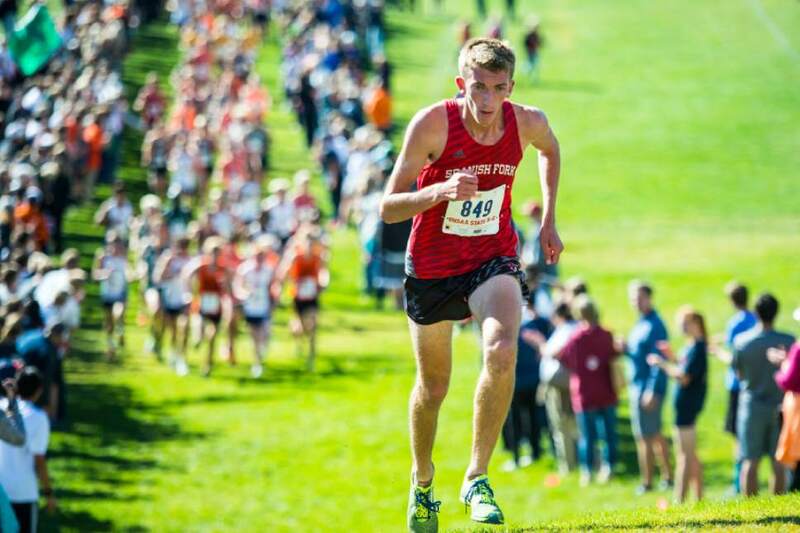 Nationally recognized and ranked, Casey Clinger and his American Fork teammates maybe were in a position to take the Utah boys&apos; cross-country Class 5A state race a little for granted. But if the Cavemen relaxed at all, it was only after Clinger led another assault on the state record book on Wednesday, as American Fork was back in the winner&apos;s circle after a year off. Clinger finished in 14 minutes, 42.9 seconds  10 seconds faster than his record-breaking time in winning last year. That existing mark would have fallen by the wayside, theoretically, even without Clinger as American Fork senior McKay Johns crossed in second place with a time of 14:49.7. In fact, even third-place Talon Hull of Weber and fourth-place Ryan Raff of Lehi all beat Clinger&apos;s 2015 time. But this day belonged to the Cavemen, who had won six straight team championships before Davis upended them a year ago. Patrick Parker of American Fork finished fifth, while sophomore Carson Clinger, Casey&apos;s younger brother, placed 14th overall. "Everyone just worked together. I think we did really well," said Casey Clinger, ranked No. 1 nationally by track website Mile Split. 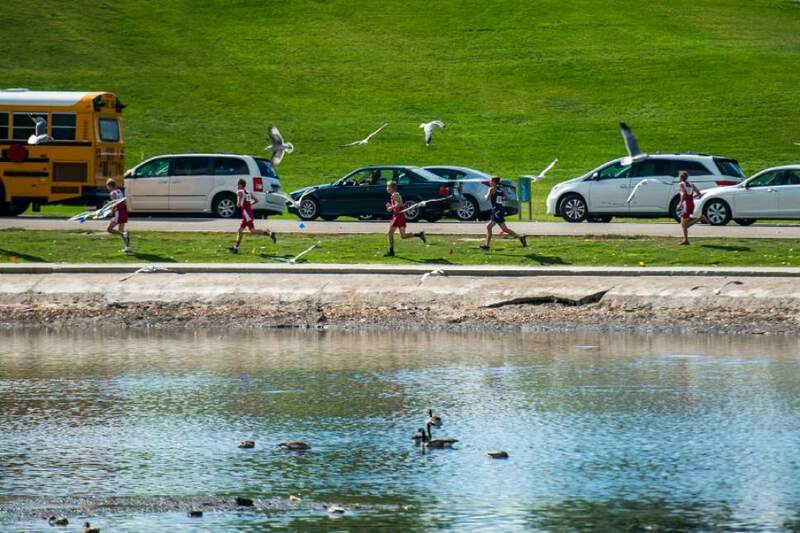 Clinger said that the Cavemen ran as a pack early from the start at Sugar House Park. "That was the plan, and then see how everyone felt  and then everyone run for themselves at the end," he said. "It was a good day. It&apos;s been a very special year, they&apos;re my best friends  a team of my best friends. It&apos;s been fun sharing the experience with them." The only race of the day that was determined in the home stretch of the three-mile course came when senior Joe Benson of Timpanogos held off Springville&apos;s Grant Gardner in the final 50 yards of the Highland High track. Benson broke the tape at 15:03.3, while Gardner, a sophomore, has a final time of 15:04.2. "I felt really good. It was just a slow race and then a kick," Benson said. "I felt him the whole time and I was just pushing hard." In 2015, Benson took fourth in the same race. 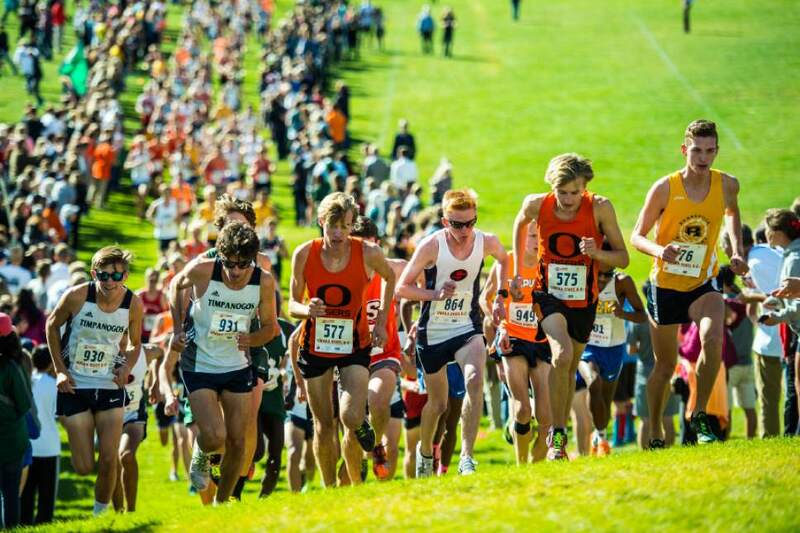 After Benson and Gardner crossed the line, Timpview&apos;s Aidan Troutner, Springville&apos;s Brandon Garnica and Ogden&apos;s Travis Feeny rounded out the top five. 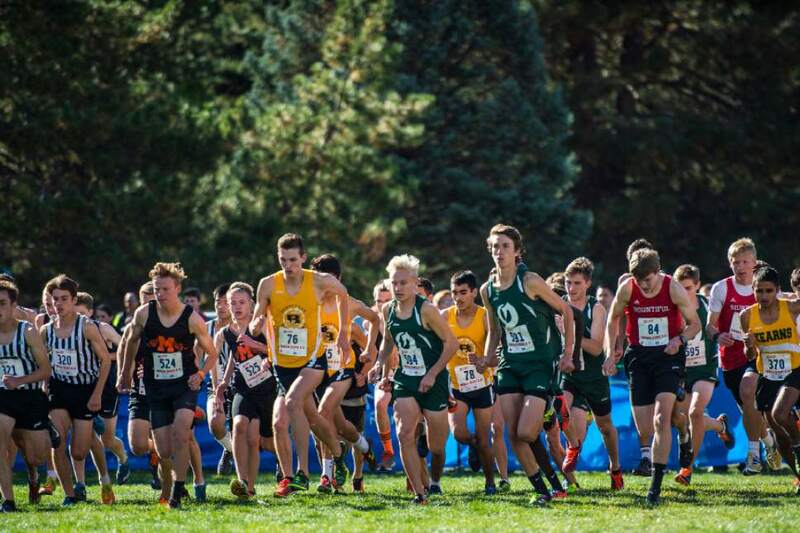 Despite Springville&apos;s two top-five finishes, it was only good enough for third in the team standings, as depth earned the championship for Olympus while Benson&apos;s Timberwolves took second. Jaiden Melendrez had knowledge of the course and familiarity with plenty of the contenders when the Desert Hills senior lined up for the 3A race. And he also had health on his side this time. Melendrez took third last year, but felt his run was hindered by a cold at the time. No such complications kept the Thunder runner from heading to the front and eventually crossing at 15:27.1  three seconds better than teammate Spencer Ford. "I didn&apos;t do what I wanted to [last year]," said Melendrez, who also finished second as a sophomore in 2014. "I think it&apos;s something everybody knows, but I just had to incorporate it more out of practice  staying healthy." Melendrez, Ford and company took Desert Hills to the team title while Pine View was second. Jace Richins of North Summit gradually started to get some distance from the pack in the second mile of the 2A race. By the time he turned for home, Richins had fairly buried the competition, as he crossed with a winning time of 16:13.2. That was 16 seconds better than second-place D.J. Matthews of Summit Academy. Dax Brough of Delta took third and Conner Cox brought Millard into the picture with a fourth-place finish. Overall, Millard grabbed the team title, with Emery and North Summit coming in second and third. Richins also won last year. "It didn&apos;t mean as much last year," Richins said. "It was much more of a challenge this year. Last year, I did it because I didn&apos;t like football. This year, I put more effort into it." 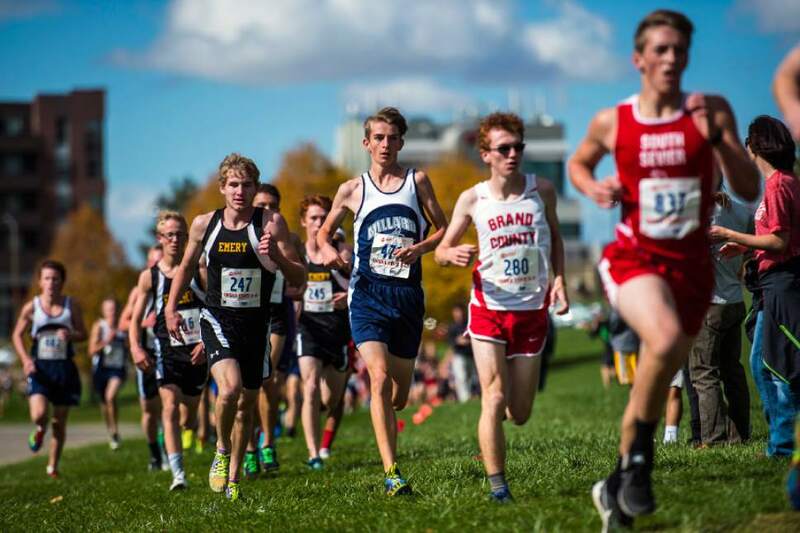 It was easy to see a grander motive for Panguitch senior Jonah Schoppe, other than the obvious one of personal accomplishment, just after he grabbed the 1A individual cross country title. That was Trenton Stowe, who helped Schoppe and the rest of the Panguitch bunch ease to a team championship. Panguitch finished with 36 points  more than twice as good as second-place Parowan&apos;s 73 points. 1. Casey Clinger, American Fork, 14:42.9; 2. McKay Johns, American Fork, 14:49.7; 3. Talon Hull, Weber, 14:50.9; 4. Ryan Raff, Lehi, 14:52.6; 5. Patrick Parker, American Fork, 15:00.9. 1. American Fork, 42; 2. Lone Peak, 75; 3. Davis, 85; 4. Westlake, 122; 5. Riverton, 124. 1. Joe Benson, Timpanogos, 15:03.3; 2. Grant Gardner, Springville, 15:04.2; 3. Aidan Troutner, Timpview, 15:08.7; 4. Brandon Garnica, Springville, 15:16.7; 5. Travis Feeny, Ogden, 15:19.6. 1. Olympus, 67; 2. Timpanogos, 74; 3. Springville, 80; 4. Ogden, 89; 5. Skyridge, 154. 1. Jaiden Melendrez, Desert Hills, 15:27.1; 2. Spencer Ford, Desert Hills, 15:30.4; 3. Hawk Call, Stansbury, 15:33.8; 4. Caleb Armstrong, Hurricane, 15:45.5; 5. Carson Horspool, Pine View, 15:51.3. 1. Desert Hills, 46; 2. Pine View, 50; 3. Stansbury, 94; 4. Canyon View, 111; 5. Hurricane, 116. 1. Jace Richins, North Summit, 16:13.2; 2. D.J. Matthews, SummitAcademy, 16:29.7; 3. Dax Brough, Delta, 16:37.2; 4. Conner Cox, Millard, 16:45.8; 5. Evan Ellison, Grand County, 17:00.4. 1. Millard, 72; 2. Emery, 83; 3. North Summit, 93; 4. Maeser Prep, 133; 5. Delta, 143. 1. Jonah Schoppe, Panguitch, 16:39.2; 2. Cody Layton, Altamont, 17:04.0; 3. Trenton Stowe, Panguitch, 17:06.4; 4. Hunter Lorenz, Parowan, 17:30.8; 5. Adam Bunker, Monticello, 17:34.6. 1. Panguitch, 36; 2. Parowan, 73; 3. Monticello, 76; 4. Duchesne, 98; 5. Altamont, 116.